Even tough I never met him, I am starting to like Ian Cecil. In the comments of the previous posting read had a different theory about what actually happens when you bump a lock. Now, I like this way of thinking. Never assume anything, test and see for yourself. It is the only way to learn and find out new ideas. So I followed Ian’s advice and assembled a cut-away lock. And Ian is right. If you just hit the key, you do not see the pins move. But …. does this mean the pins do not move? Unfortunately I do not have access to a high speed camera, so now I had to figure a way to ‘capture’ events that occur in a split second. The little wire was so short it did not made contact with the top pin. Yet, when I bumped without turning pressure, the L shaped wire jumped right out of the plug. So something was moving, and I suspected the pin to push it out. But in theory it could also be the spring. My next experiment was using grease. 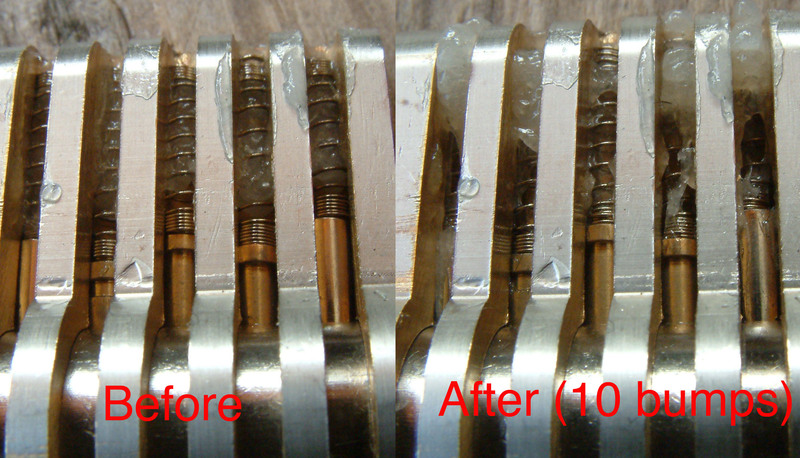 I greased up the springs and clearly photographed the cut away lock. This is the ‘before’ picture. After that I hit the key ten times (without tensioning the key), and the result is the image on top of this posting. As you can see, all the grease was pushed out severely (here is a ‘before/after’ image). And most interesting on pin 1 and 5, there was now grease on the side of the top pins! The fact there is a grease residue on the pins prove to me the pins did travel. And you can also see by the way the grease was pushed out of the chamber. Of course I could be wrong, but for now I am still convinced the bumping theory works as advertised …. This entry was posted on Monday, May 19th, 2008 at 09:42 and is filed under Uncategorized. You can follow any responses to this entry through the RSS 2.0 feed. You can leave a response, or trackback from your own site. Would be interesting to see the photographs. Very neat experiment and I would almost check the ceiling for the missing grease 🙂 It seems it has almost like shot out of the pin chambers and clearly shows that the pins jump and high. You could make a high speed camera to capture a frame of the motion. Take a disposable camera apart and wire the flash switch wires (careful of voltages) to the lock and the hammer head. When the two come together the flash should go off. Find a dark room and set a camera on a long shutter exposure (like 10 seconds). When you bump the lock the flash will go off and the image will be taken. Depending on the speed of the flash â€“ you might be able to get a picture of the bump â€“ or maybe a blur of it. Some simple electronics might be able to delay the flash signal if wanted. It doesn’t matter which way the lock is. nice idea but I don’t think it is necessarily correct. The grease is not isolated from the source of the force/vibration which is carried through the lock via the key and lock body consequently it could be these ‘shock waves’ that move the grease and not the pins. You certainly would not see these ‘waves’ although the grease would appear to have been moved. John: I bumped the lock in US configuration, and I think the grease would have come down if I understand your theory correct. We all have a pretty clear idea what goes on in the lock, and the pushed out grease, and grease residual on the pins prove to me it was the pins that pushed away the grease. Maybe I will do some more experiments with a setup Brian Atkinson advised trying my first steps in high speed photography. It is a very nice idea and I am curious about it, so maybe I will follow up on it. When i was looking at the pins when bumping there was no separation as in Newtons cradle(that i could see). It looked like the bottom pins were just bouncing the top pins up and the bottom pin couldnâ€™t go past the shear line. The important bit is that when you are bumping a lock the top pin and bottom pin donâ€™t have to separate as in a newtons cradle. The top pin just has to be pushed above the shear line. In fact i would say the bottom pin acts more like a hammer. It has to overcome the friction of the binding top pin & push it above the shear line. But that is where i saw that it isn’t just the bottom pin cant enter the top chamber, but the Top pin cant reenter the bottom chamber. Ian, the pins have to separate, or could you explain how a short keypin is able to push the driver pin over the shearline, because a bump-key has the deepest cuts only? They have to separate for the lock to bump open, no doubt. Yes that is the point. Separation is not needed. Weather it is a short or long bottom pin. The 2 pins can stick together. as soon as the top pin is over the shear line, the top pin is no longer binding. and can not fall down into the barrel again. You can stick magnets in the pins, still dosent matter. Each chamber is independent, so short or long pins dont really matter, just that the force is enough to push all the top pins above the shear line. I did another drawing to help explain what i am on about. It is quite out of proportion but hope you get the idea. You didn’t explain how the bumpkey can push the keypin so high, that the top pin rises above shearline, when the keypin is short, so yuor theory is still invalid. The theory is not invalid because of that. If the key slope makes both pins fly away, they could well travel together until the key pin is stopped at the ‘bent hole’. It has a problem explaining spool driver pins, though, because they should also be stopped before they pass the ‘bent hole’. The Bump key is still bumping the bottom pin up which pushes the top pin above the shearline. Weather it is short or long the bump from the key has great force, enough to bump the short pin up (and past) to the shear line. The spool pins dont have any real effect. I can just tell you from observation that they act like regular top pins. But i know what you are saying. Just say there are no springs in the lock. You put turning pressure on the barrel. The top pins are binding. When you bump the lock the top pins are going to shoot up when they are above the shear line. But they will fall back down and sit the edge of the barrel,until all the pins have been bumped into position. Ian’s new theory doesn’t sounds quite good to me, even though I’m not 100% convinced yet… It seems that most of us agree that a *lot* of energy is transfered to the pins when hitting the bump key. So there will be a lot of bouncing. When applying turning pressure, pins bind (can be both bottom or top pins) and lose most of their energy through friction. The other part of the pin pair can still move freely and still has lots of (kinetic) engery. It will continue bouncing around, knocking the other pin until it crosses the shearline. 1. As long as the plug is not free to turn, won’t the pins left bouncing not be able to cross the shear line as well (and possible bind there and lose energy due to friction)? Tighter tolerances (holes less ‘bent’) would make this more likely to happen and make bumping harder, but that is not what we observe. Does a cylinder with all spoll pins bump the first time? If it does, Ians theory has a flaw. Ian, why should we think a situation without the springs, becase that isn’t happening in a lock? Why do you think they will act differently? A spool pin is bumped same as a regular pin. They are usually the same dimensions and slide up exactly the same. Same as they do when a key is inserted. @ Jaakko, Bloody good experiment!!! You would expect that if you have all spool pins in a lock, applying any pressure would lock them up. But dont forget that spool pins are anti pick pins not anti bump. 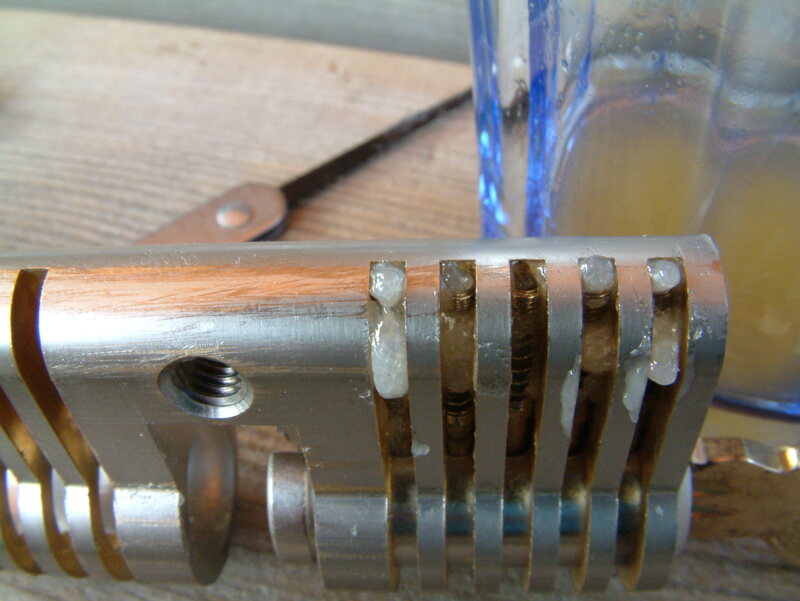 When picking, the spool pin is usually midway in the barrel. When bumping the spool pin is already pushed up so far in the barrel it has little effect. You probably need to use very small bottom pins? Thats correct When bumping, the bottom pin and the spool pin are pushed up (by the bump key) to the deepest depth. They are not sitting on the bottom of the pin chamber. It actually makes a big difference. I tried adding all spool pins to a lock to see if it would bump. I only used 3 pin chambers. & i couldn’t bump it. I am not saying it can not be bumped just that i could not do it, when before it was easy. NB. 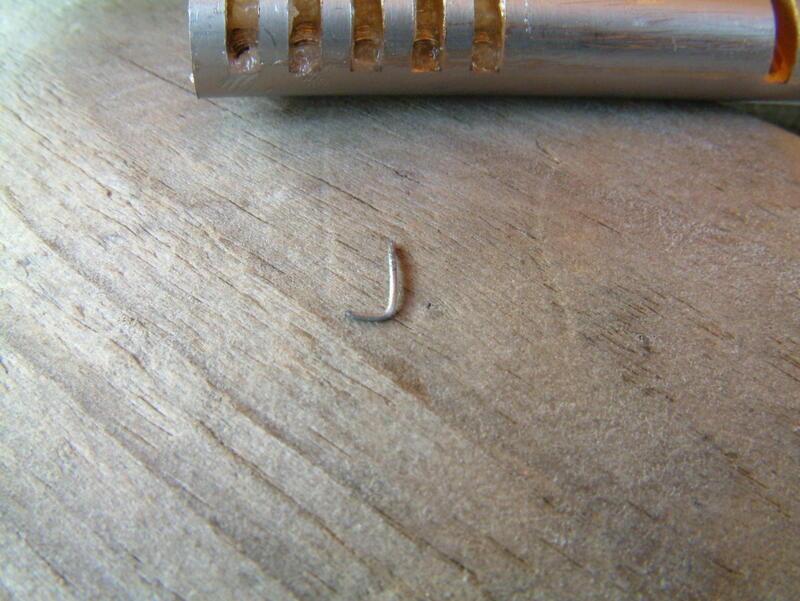 The spool pins i were using are special oversize pins made of stainless. The oversize diameter causes it to bind really easily, so if they aren’t straight they bind. That means you have to have the barrel almost dead straight to try bumping it, which is good for this silly experiment. So if you keep the key straight (no pressure) then bump and try to turn at the exact point when the pins separate. It is near to impossible. I will try it with regular spool pins when i get some. p.s. if you want some “Special” spool pins to try it just ask. I would love to hear the results with “regular” spools also, so that there can be a comparison done. I don’t need any “special” pins, I have a lathe so I can make my own if need to be 🙂 I’m just a little short on pin tumbler locks, because they are not generally used in Finland. Jaakko, i probably didn’t explain what i meant clearly. The only reason for using oversize spool pins is that the pins have to be straighter. Better for testing the Newtons cradle effect. As you said before you have to Bump then turn at the correct moment. If you have turning pressure to start with the spool pin will bind. In Australia 5 pin tumbler locks on an LW4 keyway (similar to kwikset)are considered “High/Maximum Security” by none other the (Lockwood Australia) also known as Assa Abloy. ?? Ian, thanks for the picture, but the proportions are like this only with pins that correspond to a 9 or 8 cut. The Newton’s Cradle explanation is wrong, and it is easily proved. I first came up with a design for the “ultimate anti-bump lock” that met all of the 6 criteria in theory. Only snag is, it still bumped! The idea was simple. Put a second top pin above the existing top pin, on one chamber. If the Newton’s Cradle explanation was right, this would work, as the new top pin would fly upwards, and the middle pin would stay blocking the shearline. That this trick fails shows that the Newton’s Cradle is the wrong idea. Personally, I think the way it works is that the entire pinstack is lifted by the bump, and the tension on the plug (generally applied after the pins have lifted) simply stops the top pins on the way back down, the same as a snapgun does. Nothing magical about it. Make it very hard to bump by adding a spool bottom pin and a spool top pin in one of the chambers. Currently, however, this will lead to jammed locks. There is a way to defeat bumping. A. You use a detent between the lock plug and the lock cylinder itself to increase the initiating torque to turn the plug. This closes the time window available to turn the plug when the pins are in float. B. You use a spring loaded ball in the keyway at the rear of the plug that will cause the key to ‘drag’ as it’s inserted, which will cause no problems in standard use, but if an attempt at bumping is made, the spring loaded ball will slow the bump key to the point where there isn’t enough kinetic energy transmitted to the pins to be able to succeed at bumping the lock open. 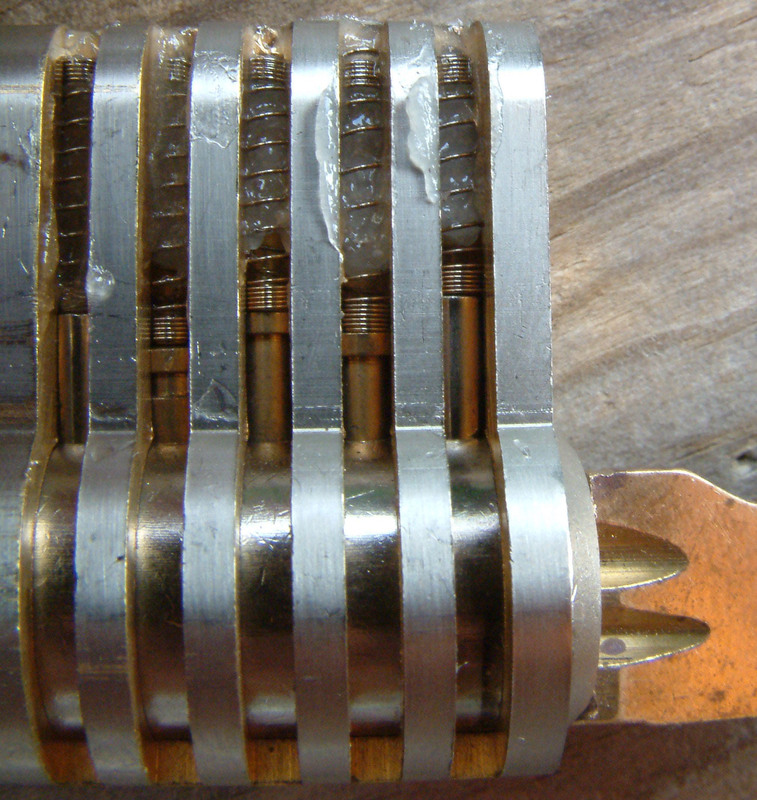 C. Such as the lock pins used in locks made in the U.S. have a pin diameter of 0.115, running a #6-32 tap into the pin chambers of the lock plug, along with replacing the top pins with ones that are made from M3 x 0.5mm threaded rod to arrest the pins from floating in to a bumped state. These modifications have been posted at another site, under my given name, so any attempt by an individual to claim this as their work is strongly discouraged. High speed camera? I’m sure you could use a much cheaper camera and a time delay + sound trigger to do your bidding.For example you set up a cutaway, try one bump, tune the time delay, and keep repeating until a satisfactory result is achieved, there’s all kinds of high speed photography documents on the internet, I’m sure someone could come up with something. Masterlock actually commissioned high speed video during the development of their bumpstop product. Their conclusion was that it wasn’t momentum transfer through impact as in the Newton’s Cradle theory but rather the entire pin stack would be accelerated upwards together by the steeples between the bitting positions but the top pin did not drop back down into the plug probably hitting the offset between the housing and the plug induced by torsion on the plug which is what lead to experimenting with shaping the bottom of a floating top driver pin. You’ll notice that their animation of lock bumping does not have the pins separating till they fall down. When you think about it, if it was the Newton’s Cradle/billiard ball analogy that was the mechanism at work, the solution would be to use lightweight aluminum bottom pins and place a heavy master pin above the top driver pin such that the momentum transfers through the driver pin to the master pin sitting on top bouncing that instead of the driver pin much as the balls in the middle of the Newton’s Cradle do not move, neither would the driver pin. The extra shear line of the master pin would not be a security concern because a driver pin is already sized such that it does not completely enter the plug when no key is present, the only issue is that the sum of the heights of the lightweight bottom pin, the driver pin and the heavy master pin can’t exceed a certain value (my guess would be 0.467 inches for kwikset locks) hence you can probably only do this in pin chambers with the shortest bottom pin, perhaps the number 1 bitting. Of course, since the Newton’s Cradle theory has been discredited by high speed footage, you probably get more benefit from mushroom top driver pins. Note that locks with sidebars don’t rotate till the sidebar has been retracted so there’s no offset till the sidebar has been released. 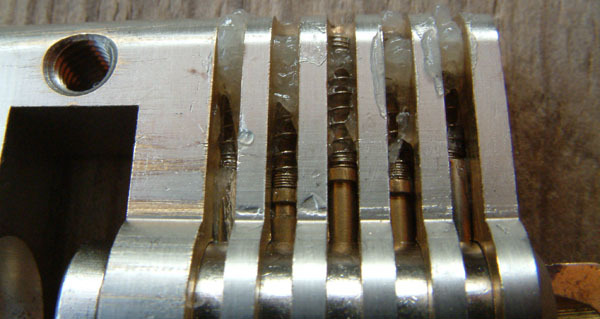 It may be better to have a torque limiter device similar to what is in a torque wrench to prevent the plug from rotating till the torsion has exceeded a certain value which is high enough to bind any unset pins preventing them from moving at all, the normal operation of such a lock would have a satisfying click when you turned the key. Entries (RSS) and Comments (RSS). 58 queries. 0.405 seconds.